Last week was huge. Busy, so busy. Between day job and freelancing, I wrote seven articles for the media. And here are two of them. I was invited to write for the ABC (our national public news service) which I was so excited and proud to do. This is the first in a series about disability and health. 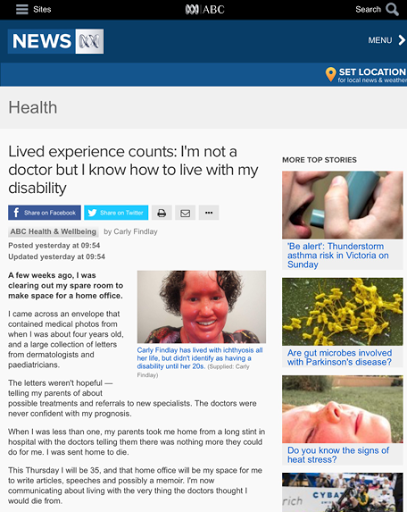 The article is about navigating the Australian healthcare system with a disability, and provides some tips to doctors. Listen to us. You can learn as much (maybe more) from our lived experience as you can from a textbook. Talk to us about our whole lives. It can be uplifting for a doctor to be excited about what's happening for us, away from our conditions. Don't show too much excitement at treating a rare patient for the first time.Sometimes that feels like you've won a prize. Let us help others who may be struggling with similar conditions. Invite us to speak at medical events or put us in touch with families. Mind your language, especially if you're a doctor who writes for publication or uses social media. Terms like "healthcare burden" are really damaging. Also I don't "suffer from" ichthyosis, I "live with" it. Take a step back to reflect on how far your patients have come, because of the treatment and empathy you've shown. Many of us we owe our lives to you. Thank you." Read the article here, and contribute to the discussion here. The other article was for Kidspot. 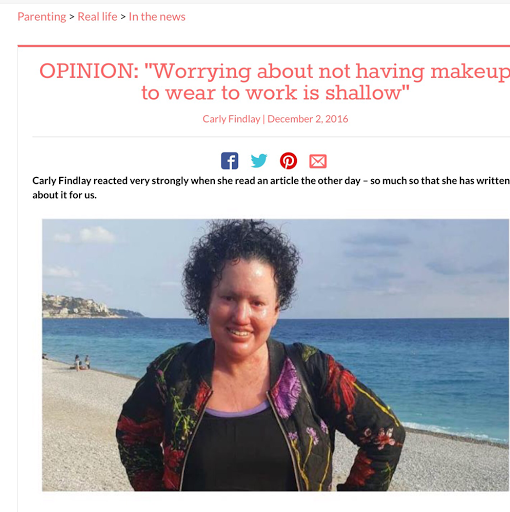 It's my response to a Mamamia article that I felt was a shallow whine. The writer couldn't find her makeup to wear to work, and so had to hide. I address the beauty privilege of the people who are afraid to go makeup free, and the expectation to wear makeup. I make no apologies for my views on this. "Minutes before I read Jessie’s article, I’d watched a harrowing piece on Lateline that told the story of an intellectually disabled woman who had been sexually abused by 10 people through her life. Later that day, as people were telling me how judgemental I was for my reaction to Jessie’s article, I found out a newborn baby in Bangladesh was killed by village men because it had Ichthyosis - the same rare severe skin condition as me. They were scared of its appearance and thought it was cursed. It was no wonder I thought Jessie’s worries about not having makeup to wear to work was shallow. I’ve found the people who are applauded for going makeup free (like Alicia Keys earlier this year ), or feel afraid to go out in public are the people, or participate in no makeup challenges (radio host Kristie Mercer did a year ago) almost always meet conventional beauty standards. They’ve got a beauty privilege." While I don't believe people with facial differences and disfigurements should be teaching lessons for those like the Mamamia writer, I do hope she and others take something away from my perspective. 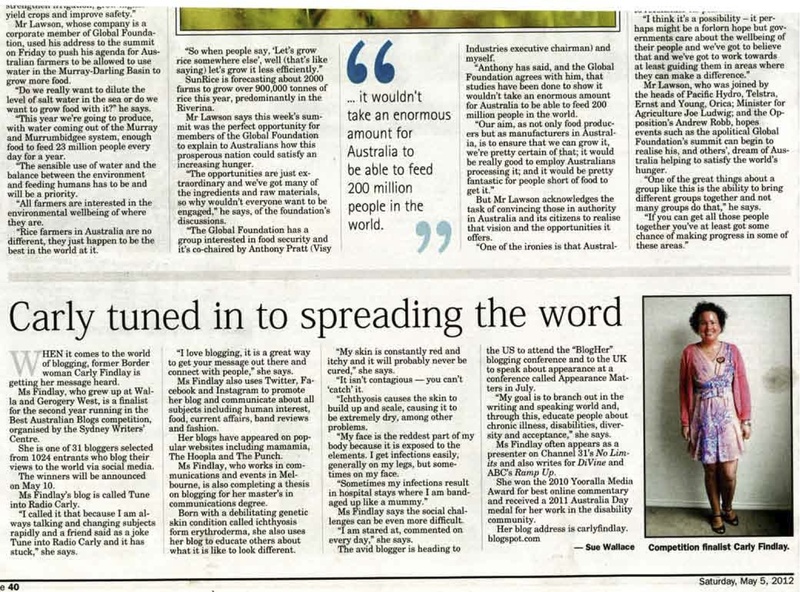 Read the article here, and chat about it here. I hope you enjoy these reads as much as I enjoyed writing them. Have you listened to my podcast yet? Tune in to Radio Carly by listening to Refreshments Provided. I go without make up for no reason other than i dont want to wear it. I also dont understand the obsession of calling people brave to appear without make up. I dont understand why some people put so much make up on that they look unnatural. I so agree with your article on the ABC. Sometimes I feel like a lot of the mistreatment of patients in the medical system comes down to medical professionals not treating their patients as people. My psyc always says to me, "why, oh why, won't doctors listen to their patients?" Belated congratulations on both of these pieces, Carly!